I don't usually make posts on Sundays but I had to quickly blog about this polish before I go to bed. I just swatched this as my Sunday mani and I am amazed! ! I got it a while back during one of the .99 cents sales at cvs/Walgreens but I never wore it. How sad! ! How so very sad! ! This is Sinful Colors: midnight blue. 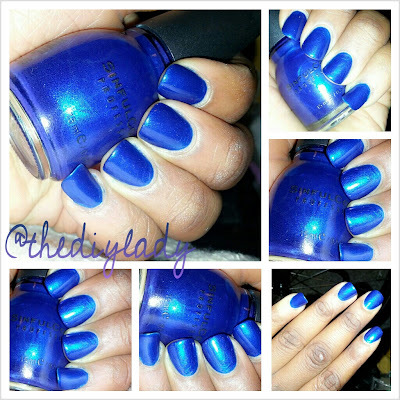 A very very beautiful blue that makes me say move over zoya - song! !!!! This is so beautiful that Whoa. .. Yes. . I had to quickly blog about it before bed. pictures were taken with my phone And even that couldn't down the beauty of this polish. If you don't have it, and you love Blues. . Please run over to your nearest drug store and pick it up. I love that i can blog via my phone. The picture quality isn't as with my camera but i hope you don't mind. I love that blue! It's so freaking pretty! Sounds exactly like what I said all day!!! LOL.. This is a really pretty blue! Indeed it is my dear. Thanks.